Just as a single bee cannot build a hive, we cannot on our own reach 1.2 billion people and tell them that solar technology can change their lives. So if you like what we are up to, come pledge your time and help us start some fires! No Smoke, No Fire, Cook Free Anywhere! A recent WHO [World Health Organization] study brings out the invisible statistic that indoor cooking smoke kills a staggering 4.5 million people every year. Very few people know that or care much about it as clean cooking is sufficiently pervasive in most countries. However, in the emerging world, the same population also is easy prey to water borne diseases as they lack access to safe drinking water - the easiest way being to boil it - something which is a luxury where fuel and cooking itself is ill affordable. When I came across this report in 2008, I questioned if it is really that difficult to provide an alternative means of cooking that not only is safe but also is affordable for anyone. After all, solar ovens can cook food and pasteurise water anywhere on the planet and the technology is proven, simple and extremely cost effective. And one day I decided to make it my life's mission to take solar cooking to every Indian household by 2020. 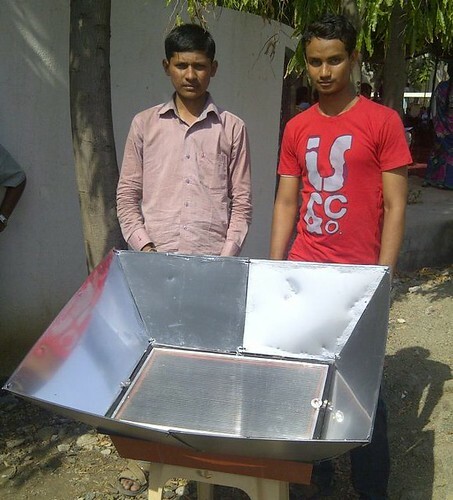 That is the genesis of Simplified Technologies - my venture to spread the joy of solar cooking. With conventional energy sources exhausting rapidly in one part of the world and inaccessibility to basic life amenities in the other part, solar energy is a prominent answer to our energy problem. 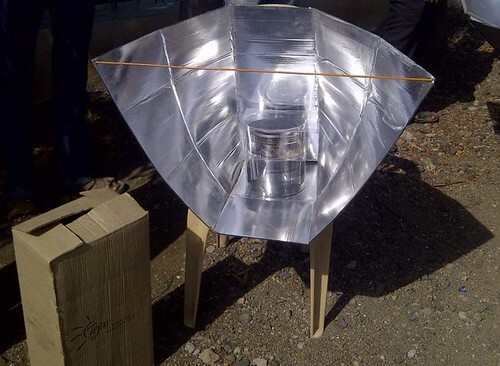 We want to break the misconception that solar energy devices are not affordable and so, we’ve designed a solar oven that can be built even by a child in just 10 minutes. It costs only Rs. 350 - that is about US$ 7 - and is so compact that you can carry it in your back pack. Really! Though we were done designing the product, taking it to 1.2 billion people was still a challenge. So, for that we came up with the idea of Suryakumbha – literally a festive gathering to celebrate the power of the Sun. 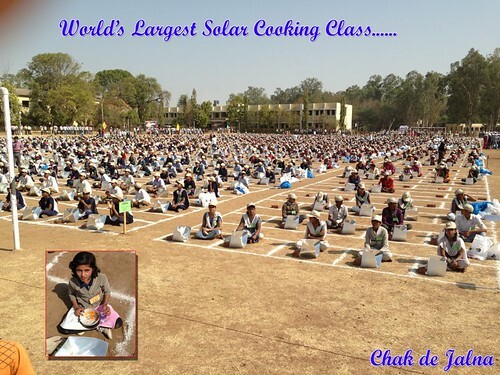 Here every single participant internalises the art and science of solar cooking by building a solar oven and cooking their lunch in it. Participants then carry the oven with them, continue cooking in it and spread the knowledge by teaching others in their school, society or village. This is how we aim to multiply our impact. We are a small team and till date we have trained over 3500 school children, including running the world's single largest solar workshop for 2250 participants on 19 January, 2013. 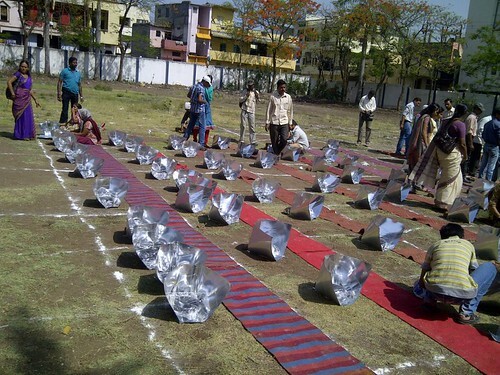 Students from 107 schools built their own solar ovens and cooked their lunch in it. It was a touching, moving and inspiring experience to witness the Sun blessing the glowing faces of the kids. It is important for any solar technology revolution to have the right model in place. We help people internalise the art and science of solar cooking by building a solar oven and cooking their lunch in it. If we can do it for more people we can end up changing lives. We want to break the fear that solar energy devices are not affordable and easy to use. We’ve designed a solar oven that can be built in just 10 minutes with easily available material. We want you to try our design and give us your feeling on whether it works for you. Your feedback will help us improve the design. Share your email address with us. We will send you our DIY solar oven guide. The material needed to build on our design is usually very easy to find wherever you live. Build the oven and use it - cook a slow barbecue! - and we will get in touch to collect your feedback. Once you build your oven using our design, we will collect your feedback and send you a really cool recipe book that we have specially designed for solar cooking. We will select one of you to be part of the Suryakumbha Team gunning for a Guinness World Record in January 2014.